Anita Diamant is an American author of fiction and non-fiction books. She has published five novels, the most recent of which is The Boston Girl, a New York Times best seller. She is best known for her 1997 novel The Red Tent, which eventually became a best seller and book club favorite. 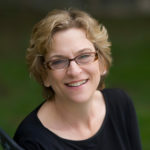 She has also written six guides to contemporary Jewish practice, including The New Jewish Wedding, Living a Jewish Life, and The New Jewish Baby Book, as well as a collection of personal essays, Pitching My Tent. "The Sabbath is a weekly cathedral raised up in my dining room, in my family, in my heart." "My husband, Jim, converted to Judaism just before our wedding." "Whatever your relationship is to your sacred tradition in the West, you have some relationship to the Bible if only through the names of the characters."